-Read the excerpt below from Matthew Balan's post at Media Research Center on Feb. 21. CBS only mentioned the protests during a 24-second news brief on Wednesday’s [Feb. 19] CBS This Morning. The network’s evening newscast, CBS Evening News, had yet to cover the story. ABC devoted three news briefs on its morning and evening newscasts since Wednesday [Feb. 19], for a total of 52 seconds of air time. BRIAN WILLIAMS: And in Caracas, Venezuela, thousands of people took to the streets again today there, where there’s growing opposition to the new president who took over after the death of Hugo Chavez. Many there are feeling increasingly let down by the socialist government. Bill Neely is there for us, and was watching it all today. 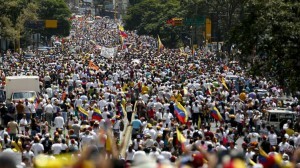 BILL NEELY (voice-over): Caracas was a sea of white fury today – tens of thousands marching against the government, angry at the killing of three protesters last week. UNIDENTIFIED MALE PROTESTER: And we’re going to stay in the streets until Venezuela is free or we have a good government. NEELY (on-camera): These protests are about a lot more than rising crime and falling living standards. This is a battle of wills – a fight for control of a revolution that still doesn’t deliver what it promises. NEELY (voice-over): This is the protesters’ new hero: Harvard-educated Leopoldo Lopez – a wanted man. He organized this protest. The government ordered his arrest for inciting violence and murder. This was his show of defiance. (clip of Leopoldo Lopez speaking in Spanish) ‘Soon we’ll have a free and democratic Venezuela,’ he said. And then, he gave himself up, surrendering to Venezuela’s national guard. His supporters were furious. (clip of protesters chanting) ‘Freedom’, they shout, ‘for him, for us.’ They weren’t the only ones on the streets – government supporters forming a river of red, calling the protestors ‘traitors.’ Venezuela tonight is tense – braced for more confrontation – this crisis deepening. Bill Neely, NBC News, Caracas. Williams’ evening newscast hasn’t covered the ongoing protests since the full report on Tuesday. NBC’s morning newscast, Today, has yet to cover the story. NORAH O’DONNELL: The leader of Venezuela’s anti-government protesters is due in court today. A defiant Leopoldo Lopez, surrounded by thousands of supporters, turned himself in yesterday. The government blames Lopez for leading a demonstration that erupted in deadly confrontations with police last week. Venezuela claims the Obama administration is siding with student protesters. They ordered three U.S. diplomats to leave the country. JOSH ELLIOTT: Also breaking overnight: three American diplomats have been expelled from Venezuela, as the regime there struggles to control violent anti-government protesters. The diplomats stand accused of conspiring with opposition forces. RYAN SMITH: Also happening right now, similar violence erupting in Venezuela – the government now spend – now sending paratroopers to a region where anti-government protesters are engaged in deadly clashes with police there. DIANE SAWYER: And now from Ukraine to South America – and another global hot spot – Venezuela – today, another round of anti-government protests in several cities there. And from behind bars, the opposition leader, accused of inciting violence, urging demonstrators to continue their fight. This week, thousands of people taking part in rallies, clashing with troops and riot police. At least five people have been killed. Protesters expressing anger over the rise in crime and the bad economy. What type of bias does the excerpt illustrate? Bias by story selection, omission and spin.